Herbs have been used for thousands of years to treat a wealth of medical conditions. In herbal therapy, the roots, flower, berries, stems and leaves of certain plants contain are crushed, dried, steeped into a tea or made into tinctures to medicate patients. These days, many people turn to herbal therapy because the products are all-natural. However, even natural products can cause adverse reactions. Consult your doctor or herbalist before taking any herbs for health. 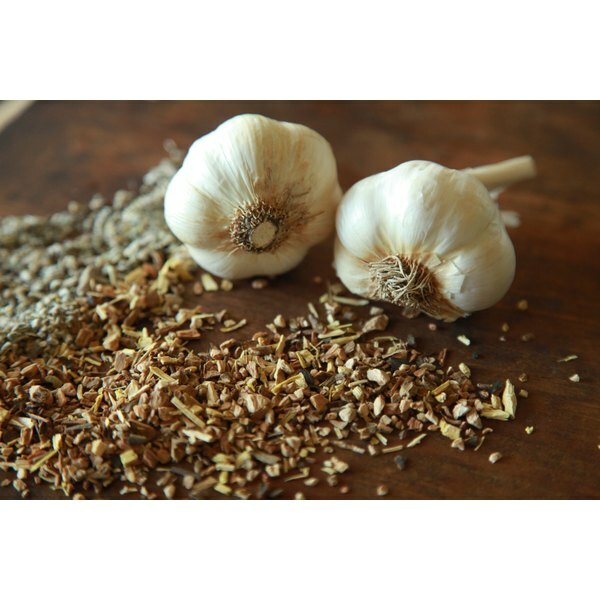 The medicinal benefits of garlic have been long established. Known as a “healthy heart” food, ingesting garlic has been shown to slow arterial hardening, reduce blood pressure, minimize the buildup of “bad” cholesterol--low-density lipoproteins, or LDL. It also acts as a blood thinner. Echinacea, also known as purple coneflower, is native to the United States and Canada. Although the herb is typically used to reduce and prevent cold and flu symptoms, according to the National Center for Complementary and Alternative Medicine, NCCAM, scientific studies have not shown that taking the herb preemptively has no effect. However, some studies have suggested that it is useful in treating these symptoms. The Natural Health and Longevity Resource (NHLR) Center adds that Echinacea can help protect healthy cells against viral infections and there is some evidence that it can reduce tissue inflammation, thus making it useful for persons suffering from allergies. Gingko biloba extract increases blood flow to the brain, which has made it a popular herb for treating dementia, memory and other cognitive disorders. The NCCAM confirms that some small studies have shown improved memory function with ginkgo biloba. In addition, the herb has been used to treat respiratory conditions such as asthma and bronchitis. It is also believed to be helpful for fatigue, tinnitus, sexual dysfunction and multiple sclerosis. Hawthorn is a small flowering tree or shrub belonging to the rose family. It is native to Northern Europe but grows all over the world. NHLR reports that hawthorn can lower high blood pressure, slow a rapid heartbeat, and aids the pumping of the heart by opening coronary arteries, which allows the heart muscle to receive critical nutrients. Hawthorn is also considered effective for mild forms of heart failure. Milk thistle, also called silymarin, has been used for thousands of years for a variety of aliments. It is most commonly used to treat liver problems--including cirrhosis--chronic hepatitis and gall bladder disorders. According to University of Maryland Medical Center, however, scientific research on the effectiveness of milk thistle for treating of liver disorder shows mixed results. The herb is also believed to lower cholesterol, reduce insulin levels in diabetic patients with cirrhosis and slow the growth of certain cancers, especially breast, cervical and prostate cancer. Astragalus is native to China and plays a central role in Traditional Chinese Medicine. In China, it is typically used, along with a collection of other herbs, to support the immune system, treat chronic hepatitis and as adjunct therapy for cancer. According to NCCAM, however, there is little scientific evidence that demonstrates the effectiveness of these herbs. A few small studies have shown that astragalus may support heart function, help bolster the immune system, and when used another herb called glossy privet, may serve as adjunct therapy for cancer. Licorice root has been shown to help treat inflammatory diseases such as arthritis, asthma and bronchitis, and can also protect red blood cells from damaging toxins. The herb is also well known as a fertility herb. According to NHLR, a clinical trial in Japan indicated it helped regulate the menstrual cycles of women with ovulatory disorders. St. John’s Wort is a plant with yellow flowers that grows worldwide. Historically, the herb has been used to treat mental disorders, nerve pain, malaria and has been used as a sedative. Today, it is frequently used to treat mild to moderate depression, anxiety and sleep disorders. Valerian is a plant native to Europe and Asia. It is commonly used to treat sleep disorders and anxiety. HerbWisdom.com notes that at least two double-blind studies have indicated that taking valerian can help people to fall asleep faster without otherwise disrupting normal sleep patterns. While the herb is generally considered safe, in some cases, valerian can amplify feelings of excitement and nervousness. Ginseng, also called Asian Ginseng, is believed to boost physical and/or mental performance. According to NHLR, studies have also shown that because ginseng improves circulation, it is beneficial to memory and learning. The herb also been shown to minimize cholesterol, protect the liver and strengthen the lungs. NHLR reports that a Japanese study suggests that ginseng extracts also may be beneficial in treating cancer.